Merci pour les bonnes recettes que vous partagez avec nous, cela me rappelle les plats que je mangeais lorsque j'étais à Resht. Ramadan Kareem, Azita. It's pleasure to read your story behind the foods. Yesterday I tried to make kabab koobideh with the same ingredients and method like yours *i got the recipe from our persian friend*, but when time to grill..all the meat falling over. do you have any idea, what that's happen ? 1- Use fresh meat with some fat. 2- Grind the meat at least twice. 3- Squeeze out the grated onion and discard the juice. 4- Mix all the ingredients very well until it becomes like a sticky ball. 5- Leave the mixture at room-temperature for at least an hour. 6- Press the meat onto the flat metal skewers and make sure the ends are sticking too. Let them adhere to the shape by leaving them to rest for at least half an hour on the counter. 7- Grill has to be hot. You want to grill the kababs on high heat and quickly. 8- Once all the skewers are placed on the grill start turning them over one by one. You'll need to repeat this until both sides are browned evenly and well done to your liking. 9- If after following all of these steps the meat falls off the skewer, you may add 2-3 tablespoons of dried bread crumbs even though this is not a common practice in kabab making. Please do give kabab koobideh another try and let me know how it turns out. 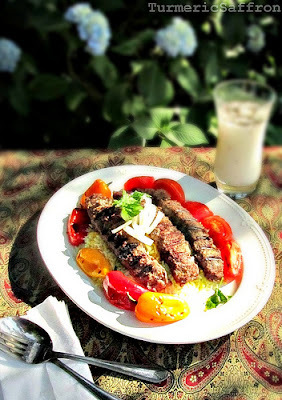 Azita joun, I had to refer to your blog from mine that people see how to make a real kabob. :-) hope you don't mind. Thank you so much, Visda jan! Sanaz, thank you for your kind words and for visiting my blog. This is beautiful.... Makes me hesitate to put the fork in it! Okay so I've been scrolling among your recipes for maybe an hour now? and I'm speechless lol I love them and I can't wait to cook them all! Amazing blog, thanks for sharing these lovely recipes with us. Yoko, thank you for visiting. My Dear Azita, thank you so much for the tips! it was work!!!! *I did Dora Dancing :)* I can't belive i made the kabab koobideh for iftar with friends, I was so nervouse because if i failed no time to change menu LOL, but everything just perfect. I was so exciting and forget to take a picture. But I will make another time and re-post to my blog with your permition off course. Again thank you so much..
Great photos! Amazing how simple the ingredients are but it is one of the best dishes to eat. I haven't tried making kabob with lamb yet..I will have to try. I love ordering lamb kabob at restaurants. This looks beautiful! Usually we just get from restaurants but I will try to make it myself one of these days only with beef (I don’t like lamb). Look delicious, can't wait to make them. If I want to make the chicken koobideh, do I use the same spices? In addition to the above ingredients, you may also want to add about 2 tablespoons of liquid saffron, 1/2 teaspoon of turmeric and a pinch of red pepper. This may be a silly question- how do you finely grind the meat? Do you use a food processor? Jonny, you can use a meat grinder, a food processor or ask your local butcher to grind the meat twice or fine. I cannot believe kubideh could be made so easily! We have something similar called seekh kebab in India. Thank you so much for your recipes! I just discovered your blog after googling khoreshe karafs because I'd forgotten the parsley/mint ratio and my mother didn't answer her phone. Usually I just call her so it's good to know you're here too! Sometimes when I make kabab koobideh it gets a bitter taste. What causes that and how can I avoid it? Am I marinating it in onion too long or using too much onion? Saman,For kabab, I use a large onion for 2 lbs of ground meat. Too much onion or marinating it for too long will ruin the flavor. You might want to adjust the flame of your grill if possible and be careful not to blacken the surface of the kababs which may char the meat and make it bitter. Turn them quickly and frequently at first so that the meat will hold and not get burned, then go slowly and longer so that it would cook well. Also, if using turmeric you may want to reduce the amount too. Let me know how it goes. Beautiful! 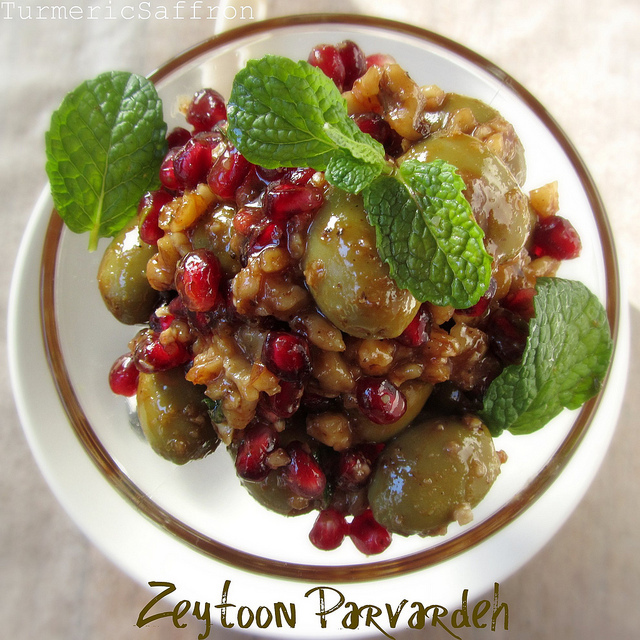 I LOVE your blog; thank you for such wonderful instructions on all my favorite, sentimental Persian foods! Your blog is a true treasure for me. My heartfelt gratitude! 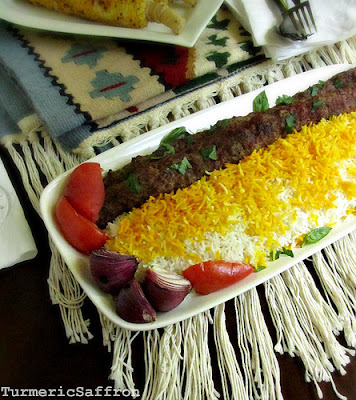 Salam wonderful blog I was searching for recipes for the kabab and many recipes I found they add egg and leave the meat overnight in the fridge. Is this necessary? Salam, thank you! It's not necessary to leave the meat overnight in the fridge. Also, there's no need to add eggs to the mixture. Great blog and thanks for your time. I would like more detail on this subject if possible. I ate a lovely kebab at Mahdi Restuarant, Hammersmith (London) the other day. The koobideh was fluffly, very juicy and had a nice smoky / charcoal flavour to it. 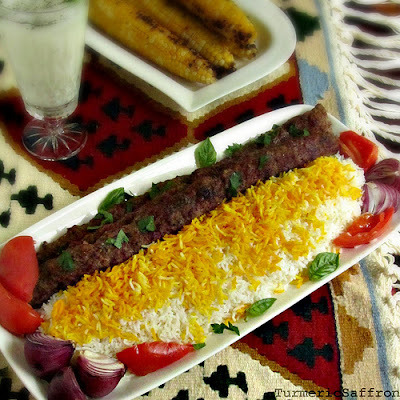 After attempting koobideh many times, I can't seem to create the juicy, fluffy and smoky flavour my taste buds crave. Do you have any ideas? I've tried the meat:fat ratio at 80:20 which helps it stick, grinding 3 times, grated (drained) onion, salt & pepper and using meat from the rib area of lamb. Am I missing something? The koobideh at this rteatuarant was fluffy, not dense. It was that juicy I forced my spoon against it and caught juice. Are they adding oil or something? I presume it's flame grilled not just turned over an intense heat? Kurosh, thank you! You may want to try adding a teaspoon of baking soda (joosh-e shirin)to koobideh to tenderize it. Also, don't overwork and overcook the meat. Thanks for the tips, Azita. Should the soda be added with the other ingredients or worked in 5 mins before forming on skewers (other sources state this)? Is 1 hour an adequate time for the meat to become tenderised? Lastly, when grinding the meat for consistency, what size attachments do you use? I.e, fine, medium or large? Does this make a difference to the texture and final outcome? First, mix all the ingredients and then add the baking soda in the last few minutes and combine well. You can leave it for a couple of hours to tenderize. I use the fine size attachment so that the koobideh will have a softer texture. Thanks. Do you baste the koobideh at any stage? If so, what's the ingredients for the basting sauce? 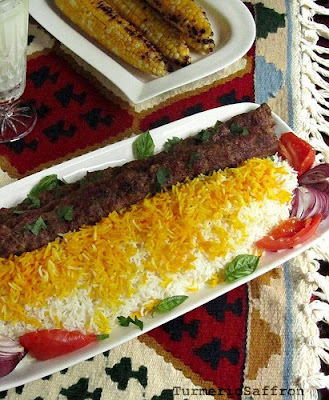 You can baste the koobideh 2-3 times during grilling. The meat becomes more juicy and flavorful when basted more toward the end. Ingredients: 2 tablespoons melted butter/extra-virgin olive oil, 1 tablespoon lime/lemon juice and a pinch of salt. I made koobideh today and it turned out very juicy. I noticed a skin type layer develop - probably caused by the baking soda. Have you experienced this? I'll try less baking soda next time. I rarely use baking soda and if I do I usually use about a 1/4 teaspoon baking soda per pound of meat. Do you by any chance have a kabab barg recipe? I searched your entire blog (yup, i read every single post :)) but couldn't find one. Thanks in advance, and lovely blog by the way! Chadi jan, yes, kabob barg is on my to do list. Thank you! Best Persian recipes anywhere, I have impressed so many people with my cooking. Thanks a bunch for making me an expert at cooking the food I love so very much. Z.D., I shared some tips in the comment section above.